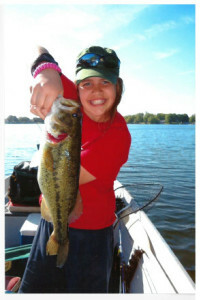 Tag Archive | "Jessa Patin"
Jessa Patin, 11, the daughter of Jerry and Kim Patin, of Solon Township, had a great day fishing recently, when she caught three big ones! The one in the photo is 18 inches long, and she also had one measuring 16-1/2 inches, and another 15 inches! Good job, Jessa, you made the Post Catch of the Week!